Mrs. Betty Roy, a math teacher, organized the original Manchester High School West team, “The PowerKnights,” for the 1993 competition. In 1994 Public Service Company of New Hampshire (PSNH) became West’s corporate sponsor until 2000. 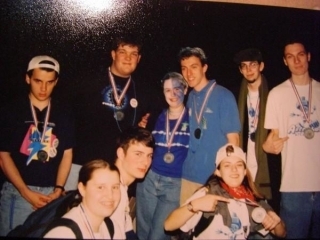 During that time, the team’s number was 146 and our name was “Blue Lightning.” As Team 146, we earned a reputation as a solid team and Blue Lightning won several GP awards as well as the national Motorola Quality award and also won the Xerox Creativity Award at the NE Regional in 1995. That year Terry Villemure, Jim Pingree and Ed Forcier joined the team as advisors. As the business climate changed in the late ‘90s, PSNH was no longer able to partner with our team. Mrs. Roy, Mrs. Villemure and Mr. Pingree retired as advisors. In 2001 BURNDY (Then Framatome Connectors International BURNDY), headquartered in Manchester, was looking for a team to sponsor and partnered with Manchester High School West. The team retook the name “The PowerKnights” and became Team 501 with Ed Forcier as advisor and Jefferson Hall as FCI’s engineer. The PowerKnights gained HomeSeer Technologies as an additional sponsor in 2005. Homeseer brought additional mentors to our team. The president of the company, Richard Helmke, taught C-Programming courses and also mentored the controls team. Karen Franz assisted as one of our travel coordinators, and also helped document the team’s finances. 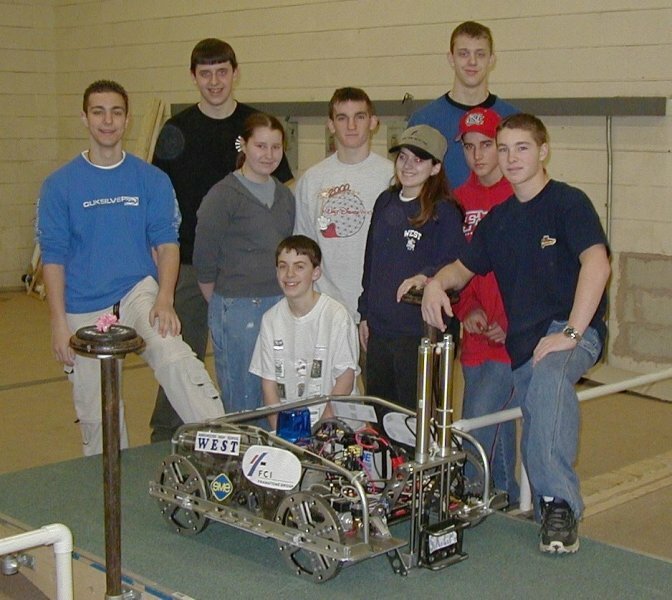 In 2007 Dyn (Then DynDNS) began sponsoring our team along with providing mentors Alan Ellis and Charles Phillips. Dyn’s initial sponsorship was geared at the VEX Robotics competition, which we have proudly participated in since. Around this time we also began fostering our relationship with Goffstown High School, accepting our first students from that school. In late 2008 mentors Isaac Onigman and Jen Hosker joined our team. Jen worked for BURNDY at the time, and Isaac started with Dyn in 2010. Our team also made our partnership with Goffstown official in 2009, accepting in as many members from GHS as west. Both Ed Forcier and Jefferson Hall retired from The PowerKnights in 2011. West provided a temporary figurehead for the team who was replaced by the Steering Committee after the 2012 Season. During this period of transition, we picked up Lead Build Mentor Adam Martin from Intelitek, our newest sponsor. In early 2012, The PowerKnights began the process of becoming a 4-H affiliated team. In 2013, the team became officially part of the 4-H STEM/Science initiative. This allows us to accept students who are home-schooled as well as younger students who would otherwise be unable to join the team.